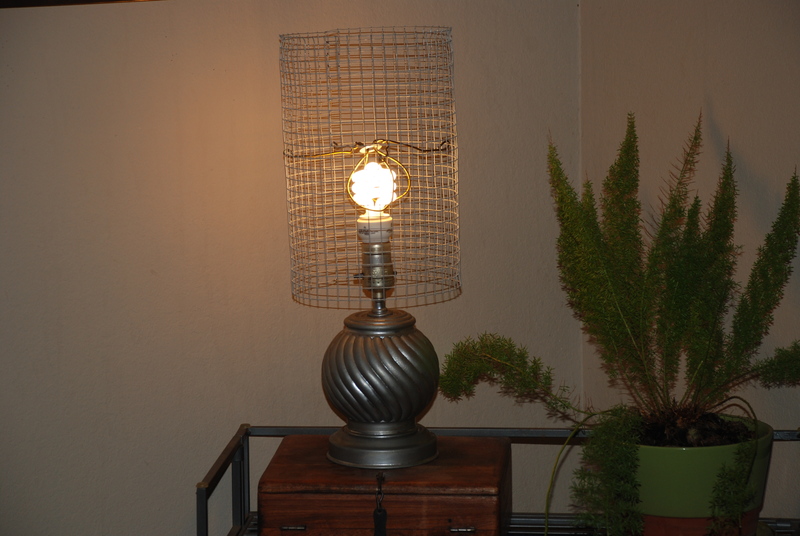 Whelp, I guess I was in the mood to do lamps over the weekend. Basically, I moved my furniture around (ah.gain) and discovered that now I needed more light in my living room. 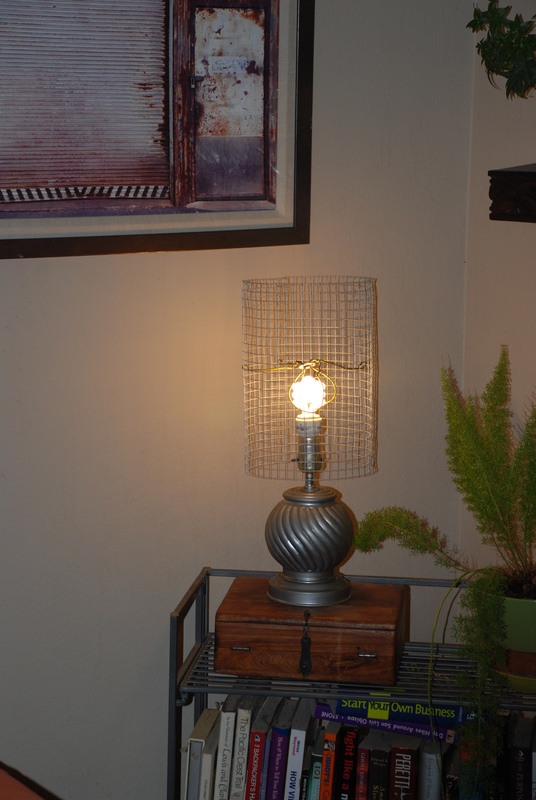 Fortunately, I was able to run out to the garage for a little lamp to put on my bookcase: Here I laugh, ‘cuz I REALLY wanted to try the faux mercury glass technique that is all the rage on Pinterest right now…..but alas, I can’t find Krylon’s Looking Glass spray paint here on the Central Coast to save my life!!! And I wanted to do this project in an instant, so, no time for ordering. Frustrating…but I decided to see if you could work the technique with a SUPER shiny silver paint. So, I fearlessly gave it a shot! 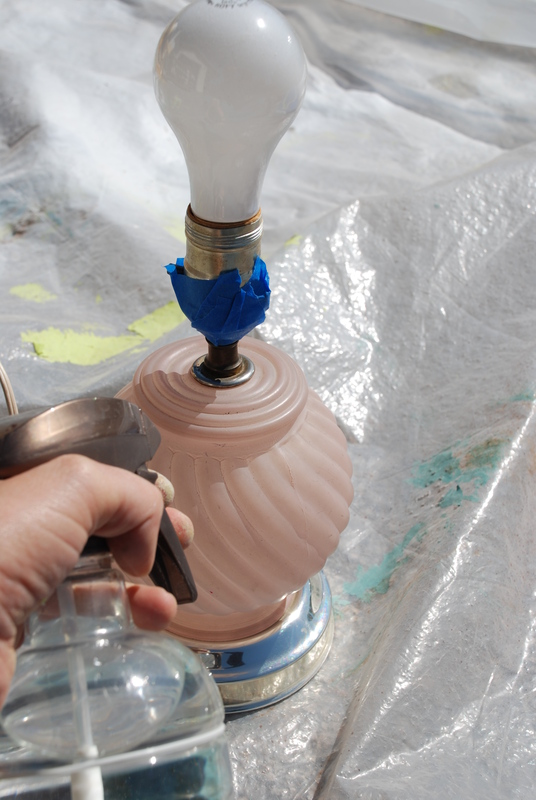 I sprayed on the water and then a coat of silver….it did make the bubbles in the paint to create the worn mirror look….but silver just ain’t good enough. 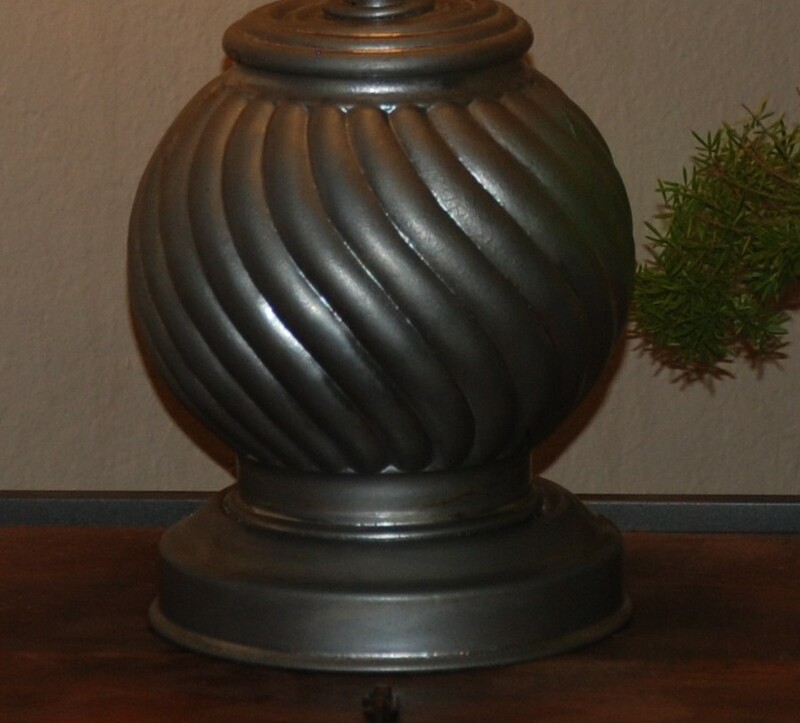 No worries, I just gave it another coat of silver spray and a follow-up coat of dark wax (to match the other silver trophy lamp I did this weekend). Super quick and easy, so it was very satisfying. Now, it was time for another run to the garage. This time I was a bit more frantic, because I didn’t have a clue what to use for a shade. Usually, I would have a renegade shade in there somewhere, that I could easily recover….but not this weekend! 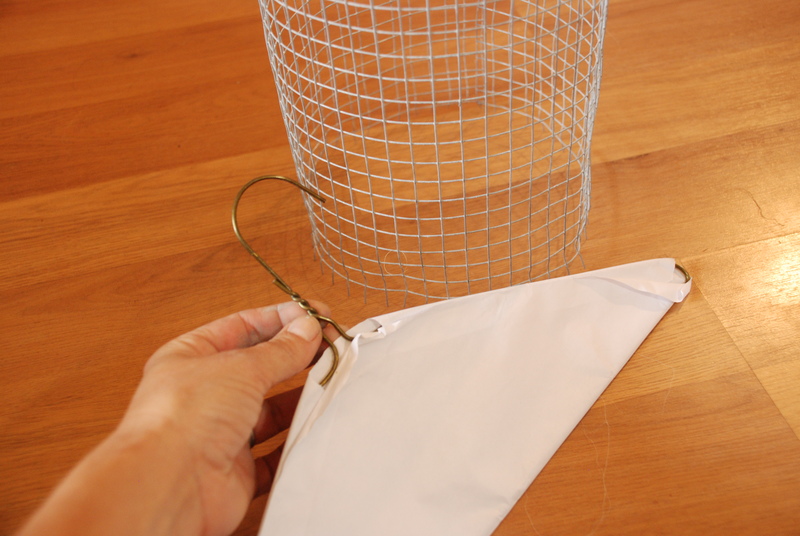 Ugh….I rummaged and pillaged all my Zest it Up stash….I searched diy lampshades on Pinterest…..I went back to the garage to search and hunt…..nothing! 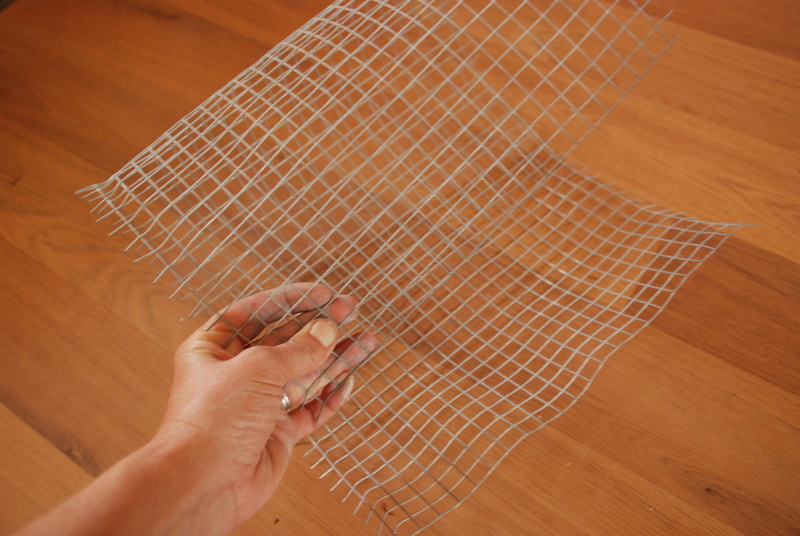 Then, an aha-moment: chicken wire! That I had! AND, I thought it would look particularly good on that bookshelf of mine..since above it hung one of my husband’s rad photos of industrial doors….now time to figure out the logistics. Bending and cutting were a cinch! 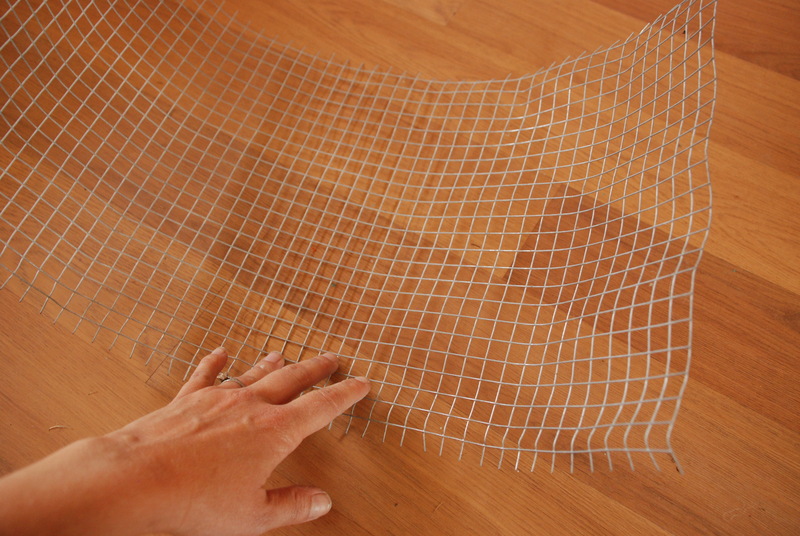 I just used the chicken wire to bend back over itself to seal the seam. 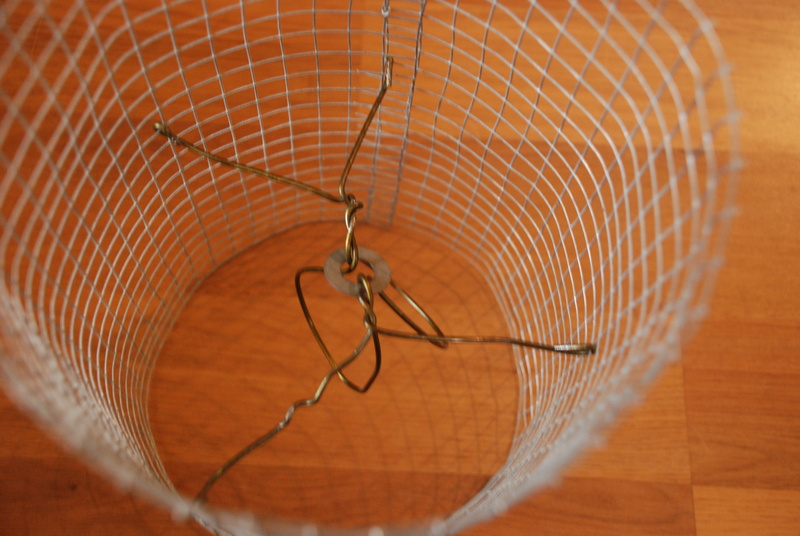 Couldn’t have been easier….really…just a bit of a scratchy process. But, now what??? How was I gonna attach it to my lamp?? Had a major head scratching moment and then I ran to our closet! 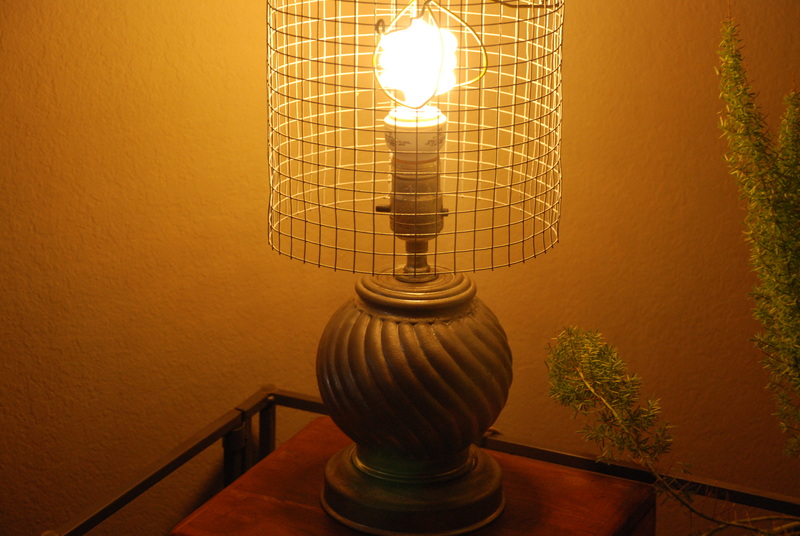 I figured that if you go for the industrial-look, then just go for it. 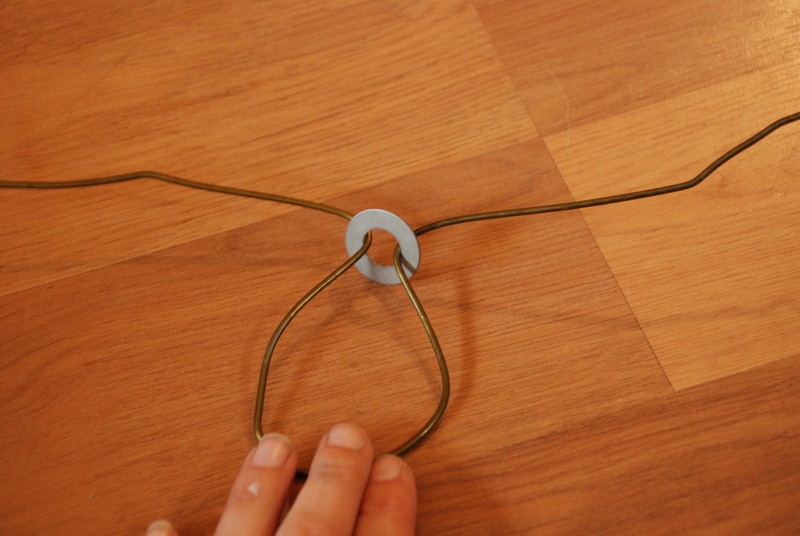 More wire, and this time, a hanger would offer the perfect gauge to work with. Time to bend and cut! 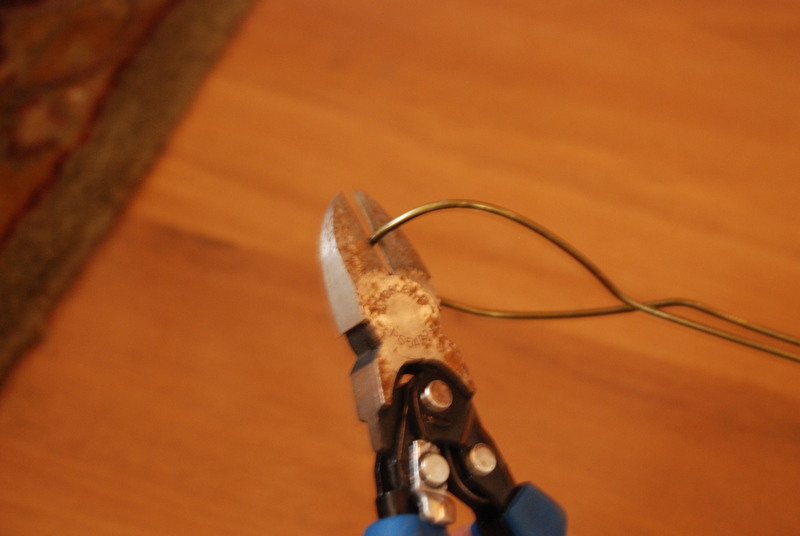 After opening the hanger up, stretching it out, bending it in half, and then cutting, I had two equal lengths of wire. Now, it was just a matter of some more bending and cutting! 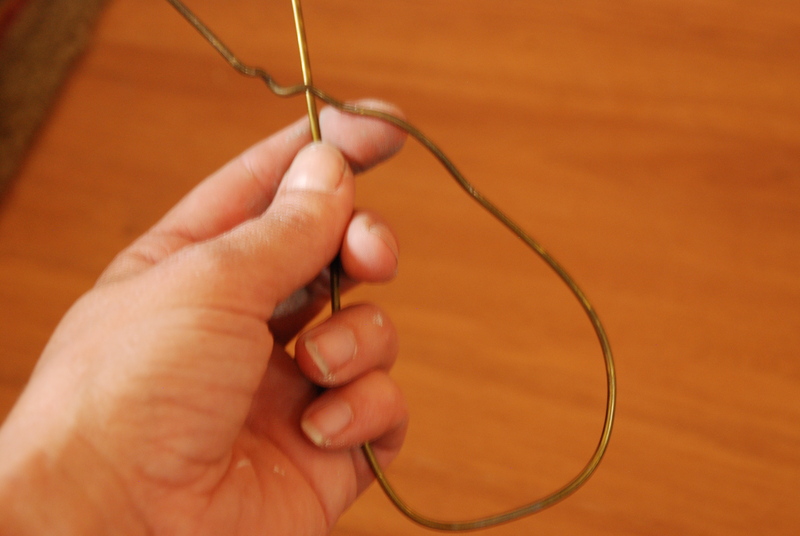 First, I bent each piece into a U shape, and then I got out a washer to start connecting them (do you see where I’m goin’ with this yet? 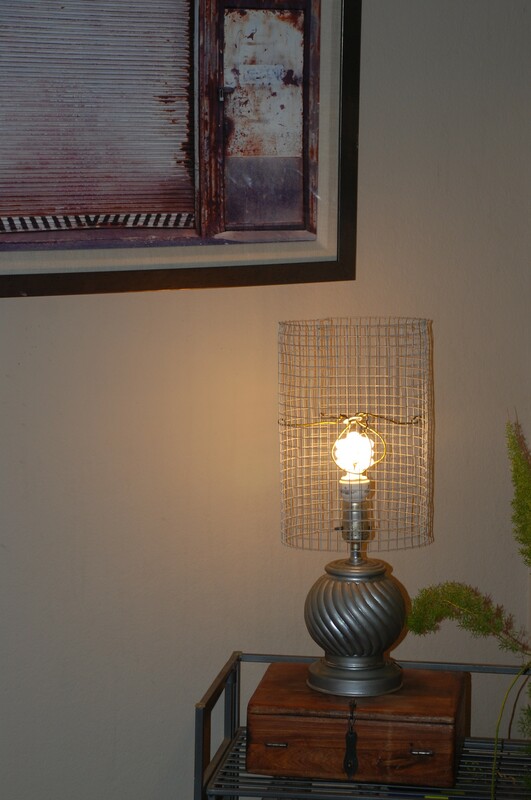 I’m trying to replicate the metal attachment in an average lampshade that essentially hugs the light bulb). 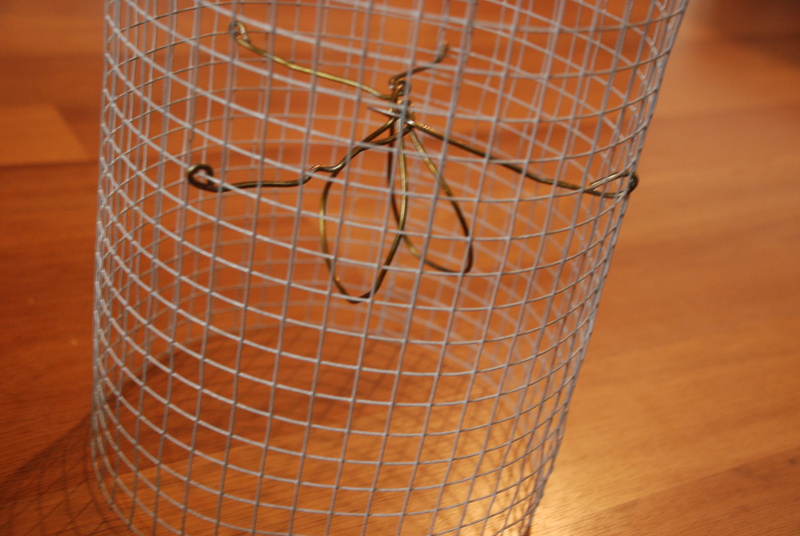 It isn’t looking perfect, but once you bend it out, the wire and your U shape are very snug. I wound up threading both of my wires through the washer, bending in opposite directions with a twist to hold them in place. A picture is worth a thousand words, right? 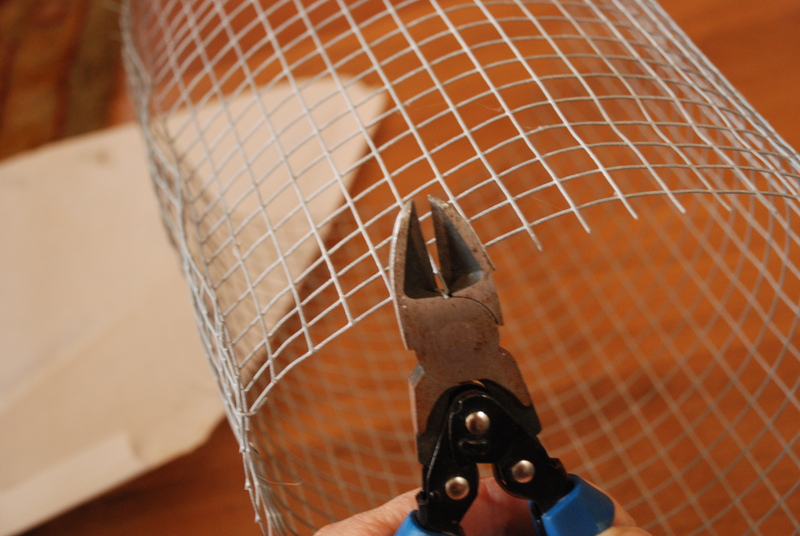 Attaching the hanger-wire to the chicken wire was easy, just cut it to size once you have placed all four wires through the same-height holes and then bend them into place. Check it out! Two lamps Zested in one weekend (albeit Labor Day weekend 🙂 ). Hey, what projects did YOU do for Labor Day weekend? Dying to see!